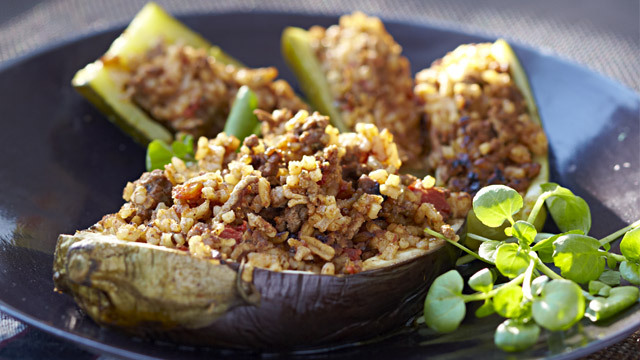 This stuffed Stuffed Vegetable recipe with exotic flavours from Italy reflects a deep sense of Tuscan flavors. The combination was great and served for lunch or even as an entree, this one works well and truly very tasty. 1. Heat oil in a frying pan and brown beef then add to the rice cooker insert pot. Place washed rice, Rice Cookers recipe base, crushed tomatoes and 400ml water into the rice cooker insert pot and stir. 2. Cover with lid and press selector control to COOK (DO NOT REMOVE LID during cooking). Cook until the selector control switches to KEEP WARM. 3. Stir through the chopped basil, then remove rice mix and keep warm. Clean rice cooker insert pot. 4. Slice vegetables in half lengthways, hollow out, fill with rice mix and stack filled vegetables into cooker being careful not to spill filling. (Alternatively, halve crossways and hollow out vegetables with a teaspoon, so that they can stand snugly in cleaned rice cooker insert pot, then fill with rice mix.) Drizzle ¼ cup (65ml) boiling water into pot. Cover with lid and press selector control to COOK (DO NOT REMOVE LID during cooking). Cook until the selector control switches to KEEP WARM. Stand for 10 minutes, then serve with fresh yoghurt. This entry was posted on July 27, 2010 at 7:02 am and is filed under Cooking, Family, Friends, People, Personal, Random, Recipe. You can follow any responses to this entry through the RSS 2.0 feed. You can leave a response, or trackback from your own site. Never ending yum on your site! Thanks! Yes, I could eat this right now! Look to see if you like one or two awards there.